Pamporovo lies on a sunny slope in the Southern Rhodope Mountains at an altitude of 1600 m and together with Borovets and Bansko is one of the three largest ski resorts in Bulgaria. It is located 260 km southeast of Sofia and 85 km south of Plovdiv. 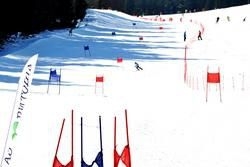 Every skiing season (November – April) Pamporovo is flooded with keen skiers and snowboarders from all around Europe who go there to enjoy its 60 km-long network of first-class ski runs and cross-country tracks. 18 lifts with a total capacity of nearly 12 000 people per hour take skiers to the ski trails and back. All facilities are maintained by a huge team of professionals who always make sure that tourists get the best possible service. And when the skiing season is over… enjoy the sun! 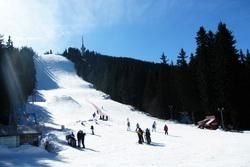 With over 200 sunny days a year, Pamporovo is perhaps the sunniest and warmest mountain resort in Bulgaria. The region around Pamporovo is excellent for hiking and mountain biking. Golyam Perelik (2191 m), the highest peak in the Rhodopes, is in the neighbourhood and so is the Rozhen Observatory. Pamporovo is definitely not as busy as Borovets and Bansko and this makes it the perfect winter destination for all those who prefer to spend their vacation in a quiet place. And the accommodation options it offers are practically endless. Tourists can choose from luxury five-star hotels, classy spa complexes, authentic little inns, neat guest houses, attractive family hotels, lovely holiday villas…the list goes on. Oh, and one more thing - when you go out for dinner, don’t miss out trying the local dishes – they are just yummy and you can order them at every restaurant or tavern in the resort. And the prices…needless to say, this is one of the most affordable winter destinations in Europe. So if you wish to have a relaxing winter vacation but you don’t want to spend a little fortune on it, give Pamporovo a try.